Heat a large skillet over medium heat. Coat the pan with nonstick cooking spray. Add the beaten eggs and stir with a spatula almost constantly for 3 minutes, until scrambled, fluffy, and cooked through. Remove to a small plate. Wipe out the skillet. Add 1 TBSP sesame oil to the skillet and increase the heat to medium-high. Add the carrots, zucchini, green beans, mushrooms, ginger, and garlic. Saute, stirring frequently for about 5-7 minutes, until slightly softened. Add the rice. The pan of veggies and rice will seem dry but you want the rice to brown and get nice and crispy. Saute the whole mixture for about 2 minutes. In a small bowl, whisk together the soy sauce and brown sugar until the sugar is dissolved. Pour into the pan. Stir the mixture to coat everything evenly. Drizzle everything with additional sesame oil (about 1 tsp). Add the scrambled egg to the pan and mix everything well. Saw this advertised (in a Facebook post) as "dinner in 15 minutes". It's only a 15-minute recipe if you have leftover cooked brown rice on hand. I don't speak Chinese. Not Mandarin, not Cantonese. But I do know that the loose translation for "Good God that's good" is a piping hot bowl packed full of this homemade fried rice. 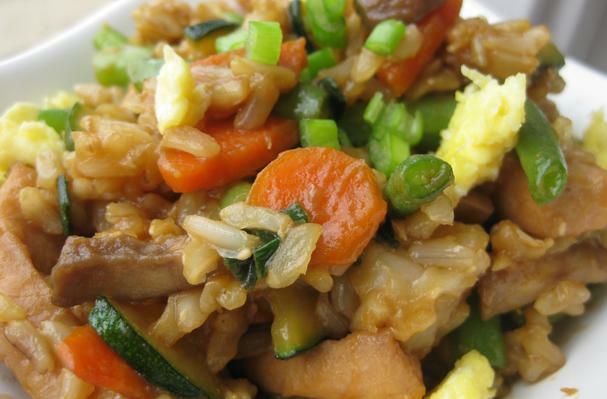 It's loaded with a rainbow of caramelized vegetables, nutty, toasted brown rice, and fluffy scrambled egg. Each forkful is soaked in a sweet and spicy ginger-brown sugar-soy sauce. Modify the recipe to incorporate whatever vegetables or proteins you like, but try not to substitute the toasted sesame oil. Using this rich amber oil is really crucial. The flavor is unmatchable- deep and smoky, cozy and warm.